As you may already know, our good friends Nathan and Ashley are getting hitched! And, with the wedding coming up in May, it was time to celebrate the bride with a special shower just for her. So us women folk gathered this past weekend to do just that, with tasty finger foods, a delicious cake and lovely floral arrangements put together by the enormously talented mother of the bride. But, of course, no bridal shower is complete without the gifts and, as I’m sure you could guess, I felt the need to get creative with mine. I really wanted to put together something unique for Ashley and eventually (after a night of tossing and turning to brainstorm) I finally came up with the idea of DIY “Perfect Pairs” Bridal Shower Gift inspired by the most perfect pair of all—Ashley and Nathan!! 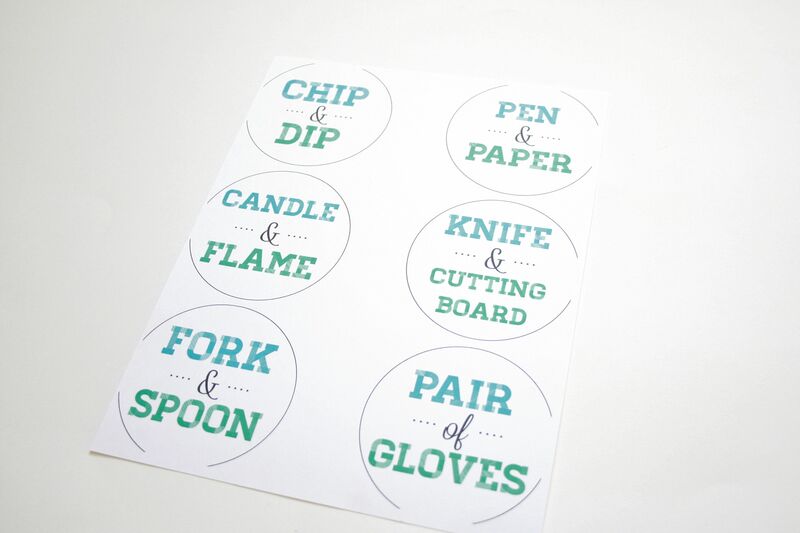 The idea was to pick up useful things for the home that naturally went together—things like “fork & spoon” (a salad fork and spoon set), “pen & paper” (nice pens and a package of note cards) and a “chip & dip” (I don’t think that one needs explaining!). In order to bring the point home, I put together little tags in InDesign and Photoshop using colors to match the overall theme of the gifts—blue and green. Once printed and cut out, I was able to attach each to their respective pair using Scotch tape. As for the wrapping, I decided to skip a paper gift bag and went with a utilitarian rubber bucket instead. It actually cost about the same as a large gift bag, but will last through whatever project Ashley puts it to. 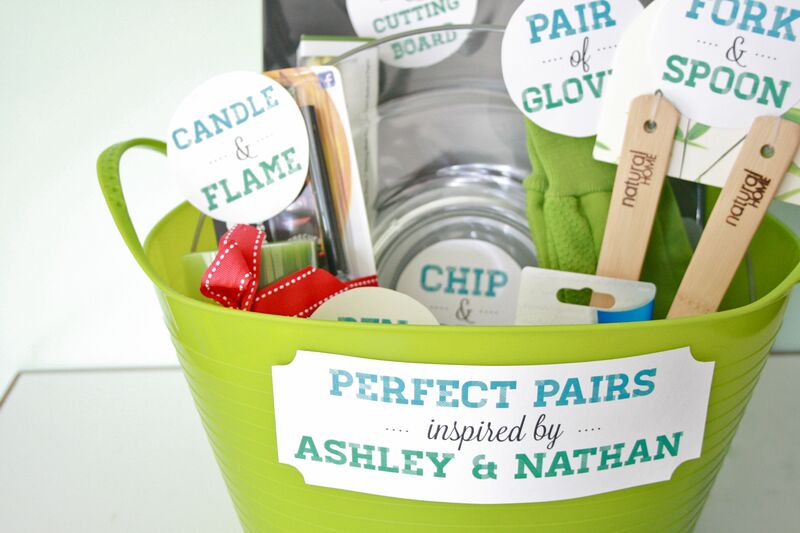 The final step was adding one last paper cut out to the front of the bucket that simply read “Perfect Pairs inspired by Ashley & Nathan.” I think Ashley got a kick out of the gift and I hope she and her hubby-to-be enjoy all of their new housewares! We had a blast watching her eyes light up as she unwrapped things like her gorgeous new dishes, Anthropology kitchen utensils, teal Keurig, serving ware and even a stunning gold Kate Spade bracelet. Bridal showers are so much fun…And Ashley deserves every bit of love! 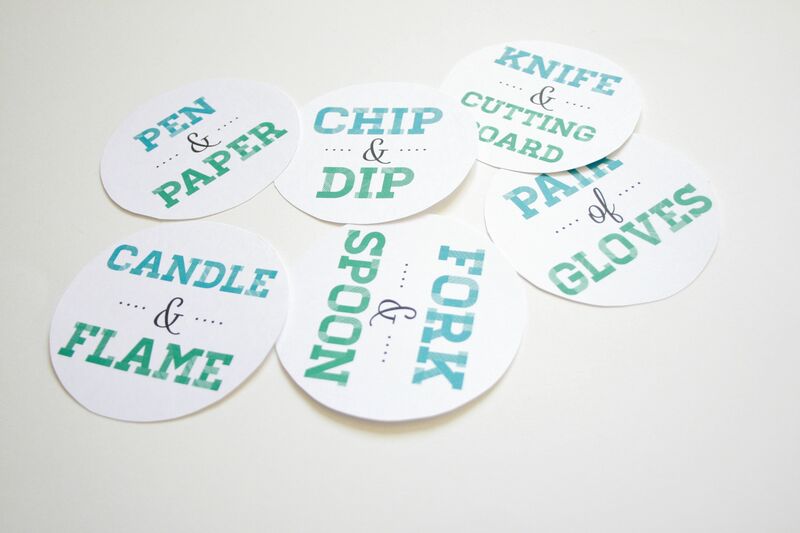 Do you have a template that I can print the tags from?